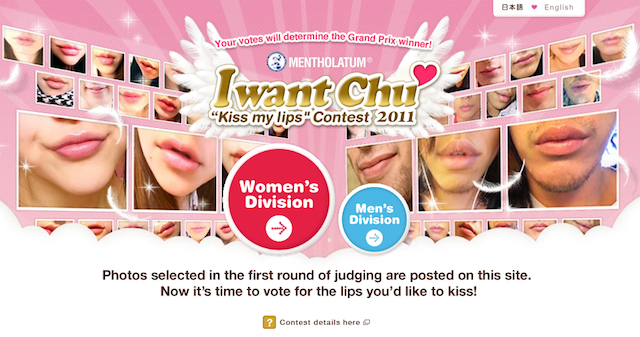 I found an interesting contest called “I want chu: Kiss my lips contest 2011” held by RHOTO Pharmaceutical Co., Ltd. This contest is part of a promotion for Mentholatum lip balm. The official website is full of photos of lovely lips, and you can vote for the most attractive lips that you’d want to kiss. The were 1800 applicants in all, and only lips which passed the first round of judging are featured on the website. There are both men’s and women’s divisions, so no matter what your preference, you can surely find your best lips for kissing. The winners will receive a prize of ¥100,000 (US$1,244) , a digital camera, and a shot at becoming a “lip model”.